Chimamanda Ngozi Adichie interviewed Hillary Clinton at a PEN World Voices Festival lecture at the Cooper Union in Manhattan on Sunday night, and she took the opportunity to confront the former Democratic presidential candidate with something that was bothering her. Why, with all of Clinton’s career accomplishments, did her Twitter bio primarily identify her as a “Wife”? I do agree with Adichie—women have worked hard to be defined as more than just wives and mothers, but to be authors, doctors, lawyers, bloggers, farmers, journalists, mechanics, and, you know, U.S. presidential candidates, and it feels like somewhat of a step back that the woman who came thisclose to shattering the glass ceiling still sees herself first in relation to her husband. But the beauty of feminism is that it means women have the choice to define themselves as they wish, and Clinton is a wife/mom/grandma just as much as she’s a former “FLOTUS, Senator, SecState, hair icon, pantsuit aficionado, 2016 presidential candidate,” as declares the rest of her bio. But Clinton said Adichie has convinced her to update her Twitter. Adichie had a good substitution. “It could say, ‘Should have been a damn good president,’” she said, to big cheers. Bet @realdonaldtrump would love that. Additional reporting by Katie McDonough. 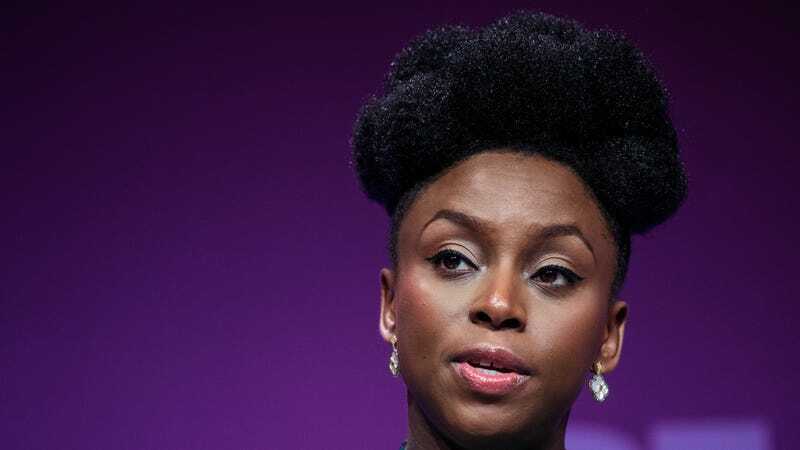 French Journalist to Chimamanda Ngozi Adichie: Does Nigeria Have Bookstores?